Across town, there was another trial going on with a defendant who was undoubtedly feeling the heat as well. This second trial was a court martial hearing for a 13th Michigan Light Artillery sergeant named Lewis Chubb. Chubb faced two charges against him at the court martial: drunkenness on duty and disobedience of orders. While one trial was for the crime of the century and the other trial was a relatively routine matter of military discipline, these two trials, occurring simultaneously, both involved one key player: listless George Atzerodt. Lewis Lorenzo Chubb was born on September 24, 1843 in Livingston County, Michigan. He was the fifth of seven children born to Major Sherwood Chubb and Achsa Bennett. On his mother’s side, Chubb was a descendant of John Webster, a settler and one time governor of the Colony of Connecticut. 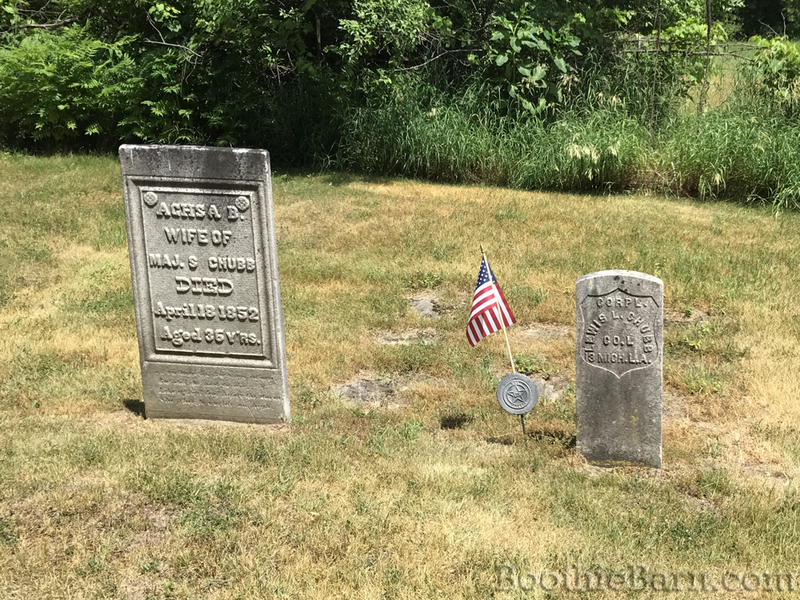 When the Civil War broke out, an almost 18 year old Chubb enlisted in the 13th Michigan Infantry. He served almost a year and then was discharged. He re-enlisted in 1863 in the 13th Michigan Light Artillery Battery for the remainder of the war. He was promoted to Sergeant in 1864. Conspirator George Atzerodt had failed to attack his target of Vice President Andrew Johnson the night before and was attempting to make his way out of Washington. He had purchased himself a ticket on the stagecoach only to find himself dropped off and detained by the very forces he was hoping to escape from. Yet, despite being in a very bad position, according to Gaither, Atzerodt did his best to act completely unconcerned about his situation. This casual drink with George Atzerodt and William Gaither was the basis of the drunkeness charge against Lewis Chubb during his court martial. However, as the court martial proceeded, the testimony of Gaither and others who interacted with Chubb easily proved that while Chubb may have consumed one alcoholic drink that day, he maintained his sobriety. This order, while helpful in regards to the few people on the Maryland side of the line wanting to come into the city, did not really help in terms of the plethora of wagons still trying to get out of the city. Col. Long, however, seeing the difficulty Chubb was facing, seemed to extrapolate on the order and deduced that he could give permission for the detained teams to make their way out of town as well. Col. Long gave Captain DuPont verbal orders to, “search all the wagons and allow them to pass through arresting all suspicious looking persons, and to take the names of all persons going through.” It was the understanding of both Col. Long and Capt. DuPont that the men who would be allowed to pass out of the city were those with teams and no one else. Capt. DuPont gave the verbal order he had received from Col. Long to Private Richmond who then presented it to Sgt. Chubb at the picket. Chubb then proceeded to send the teams on their way having already searched their wagons and taken the names of those detained. When the new order came in, William Gaither began preparations to get under way. It was now a little before 2:00 pm and the farmer was anxious to get on the road. Sitting in his wagon, Gaither looked around for the man who had requested to ride with him. 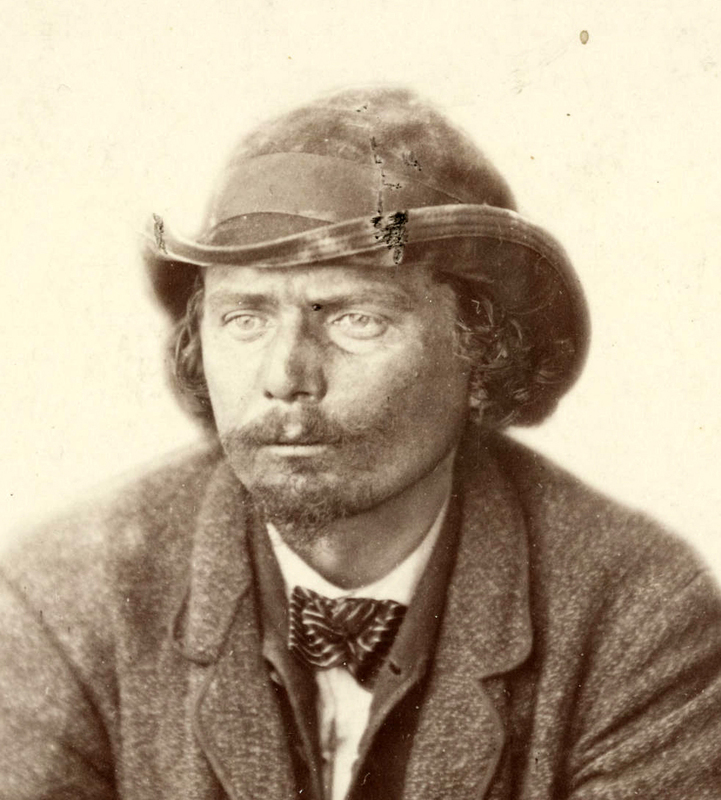 According to a statement Gaither gave after being arrested by the authorities, just as Atzerodt was about to hop into his wagon, the conspirator turned to Sgt. Chubb, made a very polite bow and said, “It’s all right so far.” With that, George Atzerodt made his way past the Union picket line and continued his escape. Atzerodt’s freedom would be short-lived, however. On the morning of April 20th he was found at the Germantown home of his cousin, arrested, and returned to “detainee” status. Gaither’s statement of how he came to unwittingly assist Atzerodt in his escape brought attention onto Chubb and the fact that the sergeant had allowed the conspirator to pass through his picket in disobedience of orders. The man who acted as prosecutor in Chubb’s court martial case was a Judge Advocate by the name of Charles Underhill. Captain Underhill successfully proved that Chubb was well aware of the fact that George Atzerodt was without his own team. At the court martial, William Gaither testified that Sgt. Chubb had taken Atzerodt off of the stagecoach himself and knew him to be a passenger. 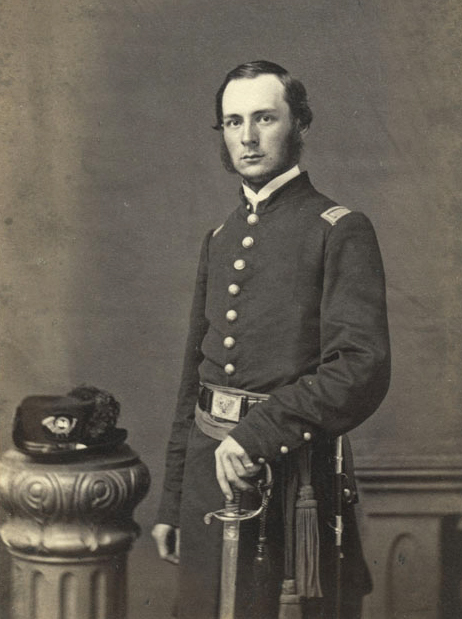 Captain Charles W. Underhill, the Judge Advocate at Lewis Chubb’s court martial. Image courtesy of Rod Coddington. Underhill called on Col. Long, Capt. DuPont, and Pvt. Richmond to testify. He also had a man named Lt. Frederick Dean testify. Though Lt. Dean was Chubb’s immediate superior that night, Dean was not involved in the transmission of orders. He did testify as to Chubb’s sober condition during the two times he saw him that day, further vindicating the sergeant of the drunkenness charge. One would think that Sgt. Chubb would be in dire straits in defending himself against the disobedience of orders charge. Though no one accused him of knowing the background of the man who bought him a drink, the fact that Chubb had allowed a man to pass his line without a team of his own, one who was later proven to be an accomplice in Lincoln’s death, would seem like a career ending decision for Chubb. Luckily for Lewis Chubb, however, Judge Advocate Underhill was curious as to the specific orders that Chubb apparently disobeyed. “Q. Did you understand that order to mean to pass anyone not suspicious looking – with or without teams? A. No, Sir. I understood the order to mean to pass only those with teams. Q. Why did you so understand it? A. On the grounds that it had been reported to me that teams were waiting there. Q. Was it so stated or given? Q. Why was not the order so worded by you as to convey your true meaning? While Captain DuPont had assumed it was implied that only those with teams could exit the city, neither Col. Long nor himself had specifically stated such. The only distinct part of the order given from Long to DuPont to Richmond to Chubb, was that any suspicious looking people were to be arrested. When receiving the order, Private Richmond had asked Capt. DuPont to clarify what he considered to be suspicious. Capt. DuPont responded, “Tell Sergeant Chubb to search the wagons and see that there are no persons concealed in them or no government property.” Private Richmond passed the order to Chubb as stated. Though it may have been implied and expected that only those with their own wagons could pass the line, this was never an explicitly stated part of the order. Therefore, Sgt. Chubb could not be held liable for disobeying part of an order that he never received. 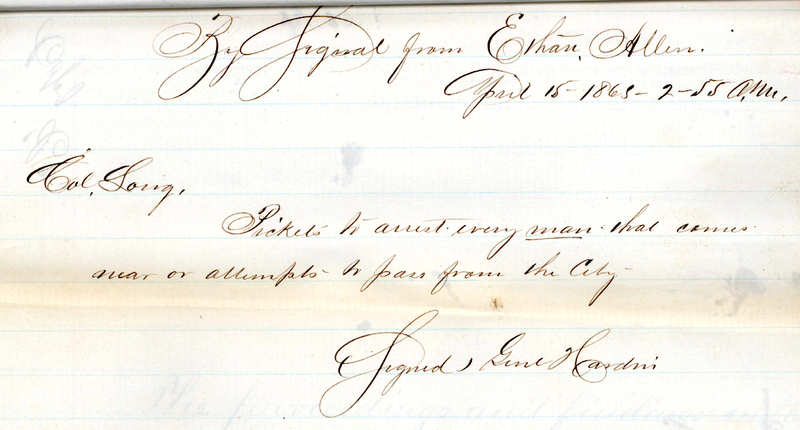 On July 1, 1865, Sgt. Lewis Chubb left the army when he was mustered out with the rest of his company in Jackson, Michigan. Six days later, the cause of all of Chubb’s grief, George Atzerodt, left this world when he was executed for his role in Lincoln’s assassination. Though much of Chubb’s life after the Civil War is unknown, he did marry Catharine “Kittie” Wood on September 12, 1888 when he was 44 years old and Kittie was about 26. This was Kittie’s second marriage and her first husband recounted that Kittie had a “bad temper” and that he “could not live with her.” It appears that Kittie may have maintained her temperamental disposition as she also separated from Lewis Chubb after only a year of so of marriage. In either the 1880s or 1890s, Lewis Chubb found employment in the railroad business. In 1893, he was living temporarily in Willow Hill, Illinois working on the Peoria, Decatur and Evansville Railway. In Willow Hill, Chubb married a woman named Louisa. Shortly after the wedding, in January of 1894, Lewis whisked Louisa back up to his native state of Michigan where Lewis worked for the Chicago and Grand Trunk Railway in Battle Creek, Michigan. While working as the yard master for the Chicago and Grand Trunk railroad, Lewis Chubb got his leg crushed after his foot was caught in a railroad V-switch (also known as a frog). His right leg was crushed just below the knee from the cars of an oncoming train. An additional newspaper report stated that Chubb lost his leg due to the accident, but it is not clear if the accident removed his leg or if it was amputated in an attempt to save his life. Unfortunately for Chubb, the trauma of the accident ultimately proved to be fatal. Lewis Chubb died on May 25, 1895 from blood poisoning caused by the crushing of his leg. He was 51 years old. In addition to the death of her husband, further troubles were in store for Chubb’s widow, Louisa. Lewis had died without a will causing his estate to enter probate. Louisa applied to become the executor of her husband’s estate. However, three of Lewis’ siblings brought suit against Louisa and her attempt to gain control over the estate. It wasn’t until after her husband was dead that Louisa learned that her husband had been previously married. More importantly, however, was the fact that Lewis had apparently never actually divorced his first wife, Kittie. Though Lewis and Kittie had separated around 1890, there did not seem to be an official divorce on the books. To his credit, Chubb did start the divorce proceedings and Kittie even wrote a reply to the suit, but they never actually went through with the full process. Since Lewis and Kittie never truly divorced, Lewis and Louisa were not technically married, despite the marriage certificate and ceremony that claimed so. The attorneys from both sides of the case sought out Kittie Wood. In the end, it was found that Kittie had, herself, died in August of 1894. With the legal wife having predeceased Chubb, the judge in the case decided to move in favor of Louisa. He cited the deceased’s intention of legal marriage and cohabitation with Louisa as cause to find in her favor. Despite the legal unpleasantness between Louisa and Chubb’s siblings, it appears that Louisa did agree with the idea that Lewis should be buried back with his own parents. Chubb’s body was transported, likely via railroad, from Battle Creek to a small cemetery in South Lyon, Michigan which held his mother and father’s grave. 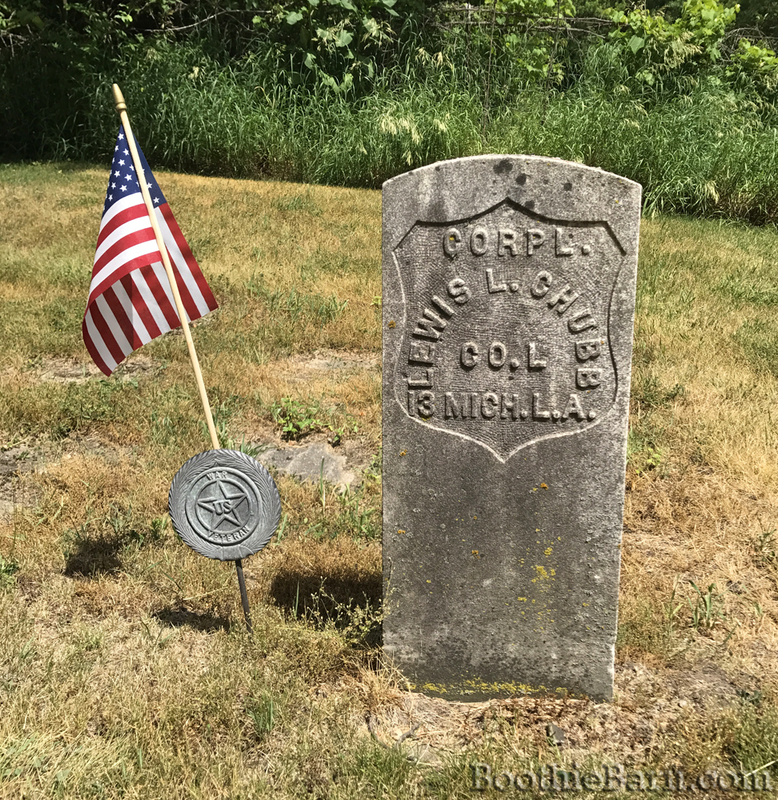 In the back corner of Green Oak Union Cemetery in South Lyon is the military headstone of Lewis Chubb next to the gravestone of his mother. Al little known person in the Lincoln plot great research! I, too, was confused why Chubb’s gravestone gave his rank as Corporal rather than Sergeant. From what I could find when Chubb re-enlisted in 1863, he did so with the rank of Corporal. He was then promoted to Sergeant in 1864 as stated. I’m not sure who was responsible for furnishing the government headstone and making sure the information was correct but my guess would be that the mistake was made there. Perhaps his second “wife” was unaware of his higher rank of Sergeant when he was mustered out. I really don’t know. Another interesting article. Was Sergeant Cobb interrogated as well. He was unaware of the shooting at that time, but Booth had given him his name I believe which would have narrowed the search substantially.